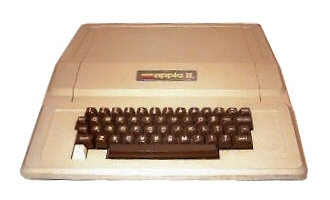 This I believe to be an Apple II europlus, however it has been suggested by persons with some knowledge of Apple II's that it is a clone. 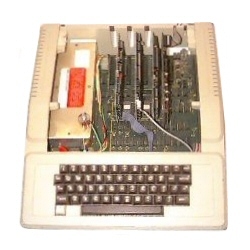 If anyone has or knows about Apple II clones I'd be interested in hearing about it, as this computer does have an Apple logo on the casing but no Apple markings on the motherboard. It came with three cards inside, one I think is a Z80 card, the others I can not identify. It seems to be in working condition, I have had it running using a spare Thompson mono monitor. Unfortunately without disk drives or software for it thats as far as my testing has gone.